Everyone of us has the potential to help alter history for someone on our planet. When a group of us harnesses our abilities and resources together, we have the ability to change the destiny of multitudes. That's exactly what is happening in the southern Philippines these days. People from Nashville, New Jersey, New York, Nevada, and Manila are pooling together their resources to make a difference in Northern Mindanao. As donations have come in through our Project: AK-47 website, and through our Just Projects International office in Franklin, Tennessee, these funds have been sent to Mindanao to build two schools in the villages of Mintosing and Akbayan, located high in the mountains of Agusan del Sur. During our time in the village of Tumalog last July, Datu Bhen introduced us to two other chiefs who explained to us that when the NPA (New People's Army) comes to their villages at the end of the year to "recruit" the children in their village, only those who are in school will be free from coercion to join. Tragically, most of the villages have no school, and so the recruitment of child soldiers and the illiteracy of 95% of the children continues. They begged us to build schools in their villages to protect their children and change their destiny. We promised to do so, and began our Project: AK-47 "Adopt A Village" program, wherein an individual, family, club, church, school, business, or organization can donate $4,500 to build a school that changes history for a village. The second part of the Adopt A Village program provides books and a teacher for the school for an additional $4,500 per year. At this time, the finances have been received to build the two schools and we still need partners for the two teachers and books. We will provide those who partner in the Adopt A Village program with pictures of "their" kids in school, and opportunities will be added to send gifts, letters, and even visit the schools in the future. As the schools grow, more teachers and supplies will be needed, but we are working to develop sustainable businesses on the tribal lands that should provide the finances in the future for this growth. We have a vision, developed with the tribal leaders, to build 50 schools during the next 5 years in an effort to eliminate the use of child soldiers in Northern Mindanao. Please Join Us in this challenge and follow us on this amazing journey. Working to impact the destiny of people is difficult work, and as you partner with us in this endeavor, we want to continually share the process with you. On November 19, Datu Bhen and his team received the first bank draft in the city of San Francisco, Agusan del Sur, that was wired to them through The LAMP Foundation, our partners in Cagayan de Oro. They then purchased gasoline and oil for the chain saw operators so they could begin cutting the lumber for the school buildings. After purchasing the other building materials, like cement, steel bars, metal sheets for the roofs, and thick plywood for school desks, they had to transport it all 50 kilometers up muddy trails by motorcycle. 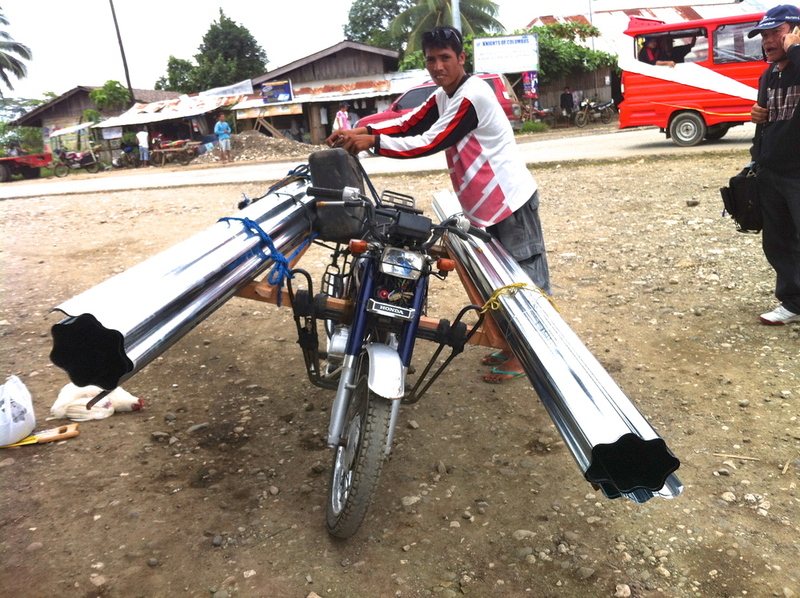 Once the gasoline and building materials arrived in Tumalog, they were transported another 30 kilometers on foot into the villages. The building process has begun ... right in the middle of rainy season ... it's not optimal, but it is necessary for the sake of the children. Ride and build together with us and with the Manobo, Banwaon, and Talaandig tribal leaders to shape history in the mountains of Mindanao. Transporting building materials via the "Skylab"
Through Project: AK-47, Just Projects International is working with tribal leaders to change the destiny of thousands of children at risk - one village at a time. If you would like to Join Us in changing the destiny of the children in Mintosing and Akbayan, you can send a check addressed to Just Projects International to our office at the address below, along with a separate note explaining that it is for the Mindanao School projects. If you would like to ask for more details about these projects before giving, you can call our office numbers below as well, and talk with one of our staff members. Project: AK-47 would like to convey to you the gratitude of the children whose lives are being changed through your generosity. We are so grateful for your teamwork and we will continue to share updates with you so you can follow along in the process and see the effects of your gifts and partnership. Stay tuned for more world changing ... one village at a time.